Iconoclasistas is a duo made up of Pablo Ares (graphic artist, designer, comic strip author) and Julia Risler (communicator, researcher and teacher at the University of Buenos Aires). They have been working together since 2005, based on the idea of a "laboratory", understood as a space where using the imagination sparks creativity and enables them to shift easily between different formats, devices and scenarios, while making use of research and graphic design tools that promote collaborative practices. They have created printed materials dealing with social issues which have been published in newspapers and magazines in different parts of the world. These materials formed the basis of traveling shows that have toured different provinces in Argentina, along with Spain, the United States and various countries in Latin America. 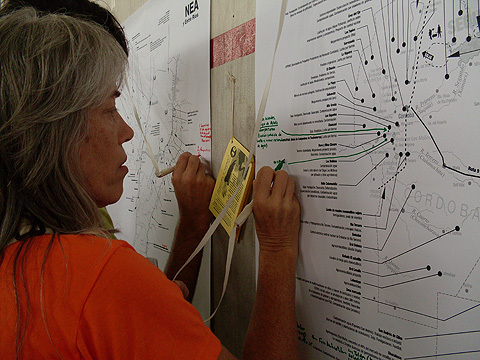 Since 2008 they have been conducting collective mapping workshops in conjunction with social movements, gender groups, communication collectives and art groups, using maps and multiple devices to disseminate forms of knowledge and experiences in order to collectively shape a transforming narrative of a territory. They have also generated urban interventions and animations, and many of their images are distributed using unconventional formats such as T-shirts, picture cards and pins. They use those dynamics, creative devices and playful methodologies to promote a space in which to experiment, develop open-source materials and organize collective-creation workshops combining graphic design, communication and research to generate resources designed to break away from hegemonic definitions, not only as a means of resistance and to influence the social imaginary, but also as an avenue for change and transformation. Sofía Olascoaga interviews Iconoclasistas about their critical, collective, emancipatory mapping practice.